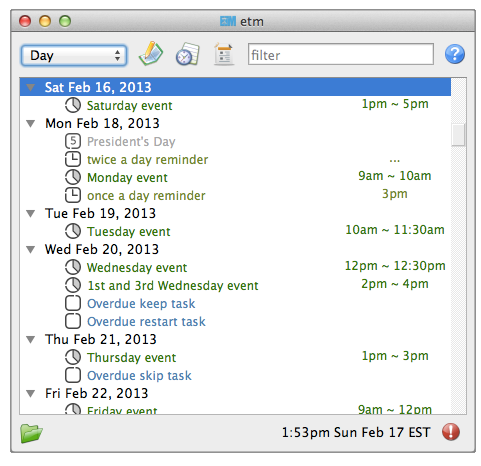 etm is an acronym for event and task manager. 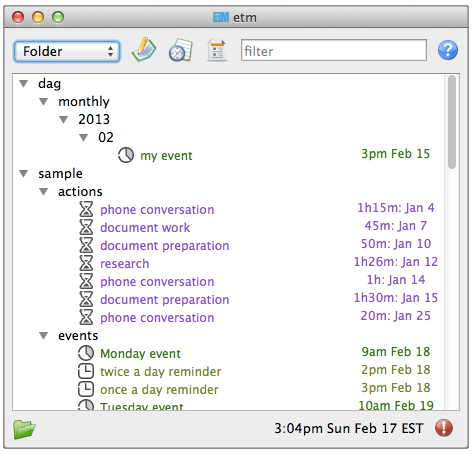 This application provides a simple, intuitive format for using plain text files to store events, tasks and other data items. Items can be created, modified and viewed in a variety of convenient ways using either the command line or a cross-platform, PyQt based GUI. Repetition is supported in a powerful and flexible manner for tasks as well as events. 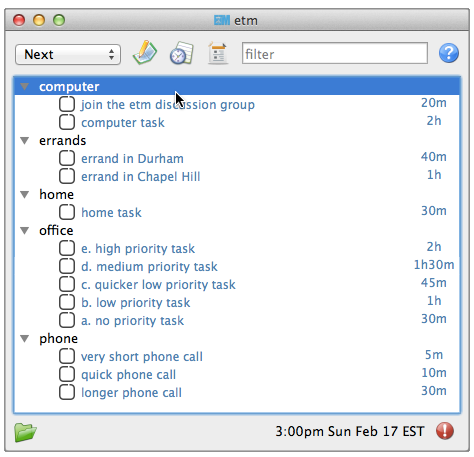 Supported alarm types in the GUI include display, sound, voice (using system text to speech), email, text message and process. 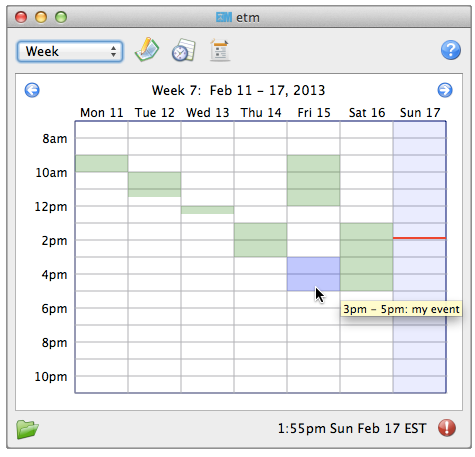 This is the home page for the version of etm that is based on Qt. A newer version based on Tk is available at etmtk. 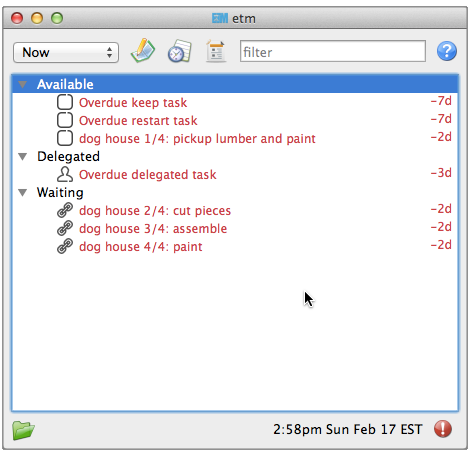 In contrast to most calendar/todo applications, creating items (events, tasks, and so forth) in etm does not require filling out fields in a form. Instead, items are created as free-form text entries using a simple, intuitive format and stored in plain text files. 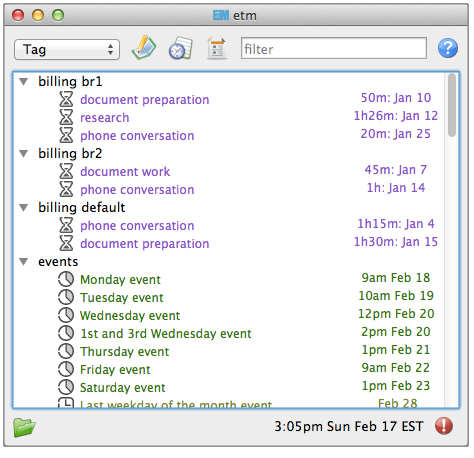 Items in etm begin with a type character such as an asterisk (event) and continue on one or more lines either until the end of the file is reached or another line is found that begins with a type character. The beginning type character for each item is followed by the item summary and then, perhaps, by one or more @key value pairs. The order in which such pairs are entered does not matter. Approximately 29 minutes - click image to play.